International Desk: Rogue waves - huge swells that can appear from calm seas - are occurring less often but becoming more extreme, data from the US coast suggests. In the largest study of its kind, scientists analysed 20 years of observations from buoys situated along America's western seaboard. They found that between 1994 and 2016, the waves decreased slightly in frequency but increased in height. Scientists want to better understand how and when these waves may strike. They pose a growing threat for the global shipping industry. Defined as a wave that's more than twice as high as the background ocean, some can reach more than 30m and at their most destructive can sink a ship or sweep people out to sea. It's estimated that one in 10,000 waves is a rogue wave - but while they've been the subject of marine folklore for centuries, they were first officially recorded in the 1990s. Since then scientists have been trying to study them. 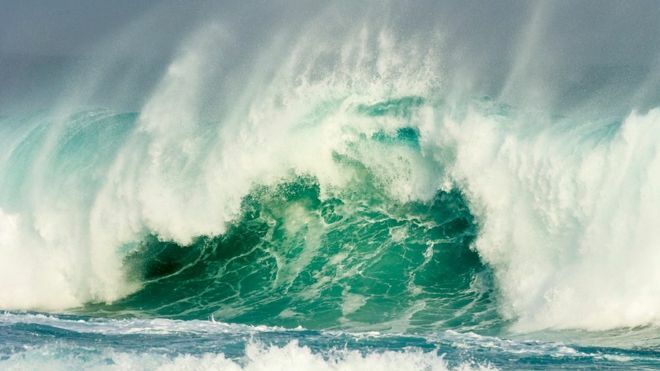 "People have looked at rogue waves in short-term records, but we were interested in long-term trends," said Professor Meric Srokosz from the UK's National Oceanography Centre, who carried out the research with the University of Southampton. We've pulled together the largest dataset that's ever been put together on this topic." Over the period of two decades, the team found that the height of the rogue waves was increasing by 1% year on year. "They changed slowly over two decades... but over a long period of time it will make a difference." The researchers also found that rogue waves varied over the seasons. Prof Srokosz said: "There are more rogue waves in the winter and they tend to be 'more rogue' - that is in terms of the relative height of a rogue wave to the background waves." The team want to investigate what is driving these changes and to see what part climate change might be playing. "We have evidence the winds are increasing over the ocean from satellite data - and the waves are generated by the winds. So stronger winds will generate more waves or bigger waves," said Prof Srokosz. "But it's quite complicated because the waves are interacting with currents, which are also changing with global warming. So it's not easy to say there's a single factor." The team said its findings, which are published in the journal Scientific Reports, could be specific to the area of ocean that was studied, and more data would be needed from around the world. How much water should you drink a day?